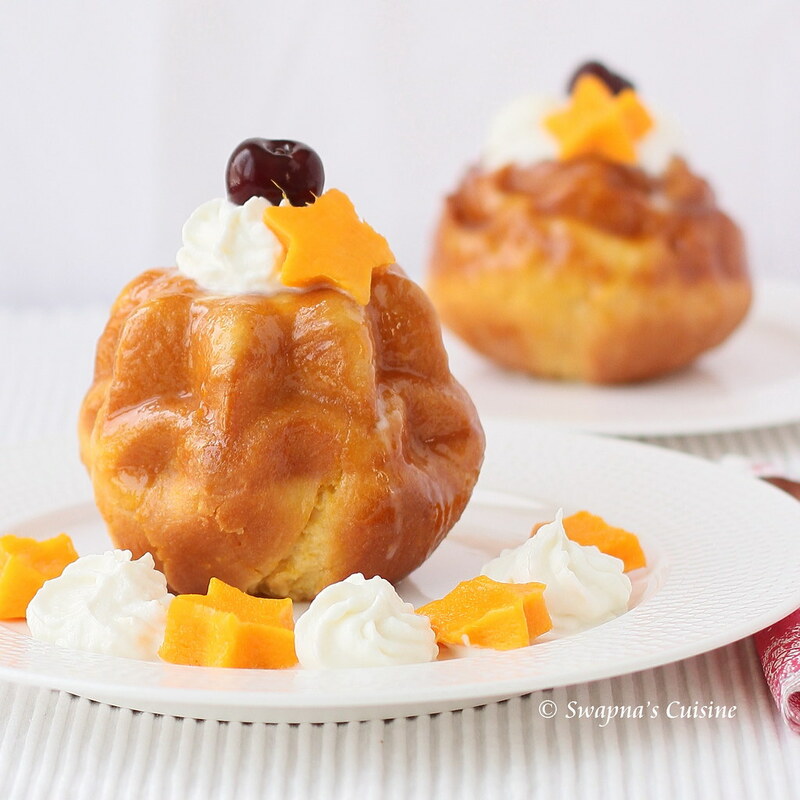 Savarin is a yeasted cake made with the same dough as Rum Baba. 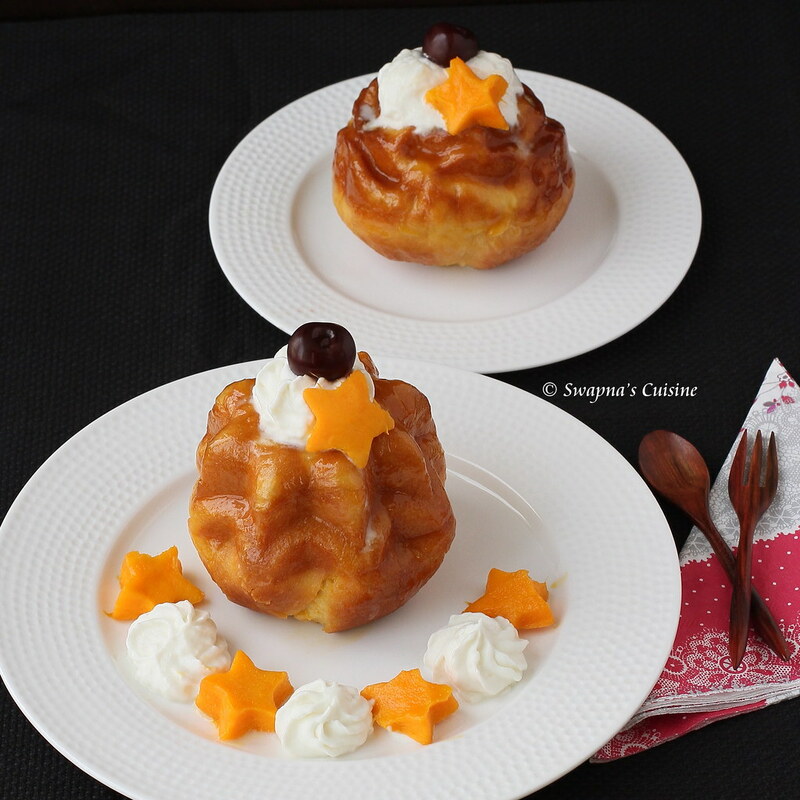 I made Rum Baba a couple of years back… the difference between the two are, rum baba has raisins or currants in the dough and is baked in tall cylindrical baba mold and served without a filling. Savarin is made without raisins and baked in a large ring mold and the hole in the centre is filled with pastry cream and fresh fruits. I made a Mango and Passion Fruit flavored soaking syrup. The glaze was made with mango jam. I served the Savarin with fresh mangoes and vanilla whipped cream. I halved the recipe and used 2 small bundt pans for baking. We all enjoyed the Savarin and thank you Natalia for a great challenge. In a small bowl mix 2 tablespoons (30 ml) lukewarm water, 3 tablespoons (1 oz) (25 gm) flour and yeast, cover with cling film and let rise 60 minutes. After 30 minutes put the egg whites in the mixer bowl and start working with the paddle at low speed adding flour until you have a soft dough that sticks to the bowl (about 2 cups or 270 gm) and work until it comes together , cover with cling film and let rest 30 min. Add the sponge to the mixer bowl along with a tablespoon of flour and start mixing at low speed (if you wish to add the zests do it now). When it starts pulling away from the sides of the bowl add one yolk and as soon as the yolk is absorbed add one tablespoon of flour. Add the second yolk, the sugar and as soon as the yolk is absorbed add one tablespoon of flour. Raise the speed a little. Add the third yolk and the salt and as soon as the yolk is absorbed add one tablespoon of flour. Keep on adding one yolk at the time and the flour saving a tablespoon of flour for later. Mix the dough until is elastic and makes “threads”. Add the butter at room temperature and as soon as the butter is adsorbed add the last tablespoon of flour. Keep on mixing till the dough passes the “window pane test”. Cover the dough with cling film and let it proof until it has tripled in volume (2 to 3 hours). You can prepare the Pastry cream now if you chose to use it, and refrigerate it. While you wait prepare your baking pan buttering it very carefully not leaving too much butter on it. Grease your dough scraper, your hands and your work surface and put the dough on it and fold with the Dough Package Fold two or three times around (5 folds twice or three times). Cover with cling foil and let it rest 15 minutes on the counter. Turn the dough upside down and with the help of your buttered dough scraper shape your dough (check this Youtube video) in a rounded bun. Make a hole in the center with your thumb and put it in the prepared pan. Cover with cling film and let rise in a warm spot until the dough reaches the top of the pan (about 1 hour). Pre-heat oven to moderate 340°F/170°C/gas mark 3. Bake the Savarin for about 40 minutes until the top is golden brown. When the Savarin is done take it out of the oven and let it cool. You have two choices now : you can immerse it in syrup right now or you can let it dry out (so it will lose some of his moisture that will be replaced by the syrup) and soak it later on. To immerse it in syrup it is a good idea to place it in the mold you baked it in (I’m afraid a spring-form one wouldn’t work for this) and keep adding ladles of syrup until you see it along the rim of the pan. Or you can just soak it in a big bowl keeping your ladle on top of it so it doesn’t float. Once the Savarin is really well soaked carefully move it on a cooling rack positioned over a pan to let the excess syrup drip. The soaked Savarin gains in flavor the next day. Whatever you decide the day you want to serve it glaze it and fill the hole with your filling of choice and decorate it. You can serve the Savarin with some filling on the side. Combine water, sugar, lemon zest and cinnamon stick and bring to a boil. When cooled a bit add the mango pulp and passion fruit squash. In a saucepan mix jam and water and warm up. 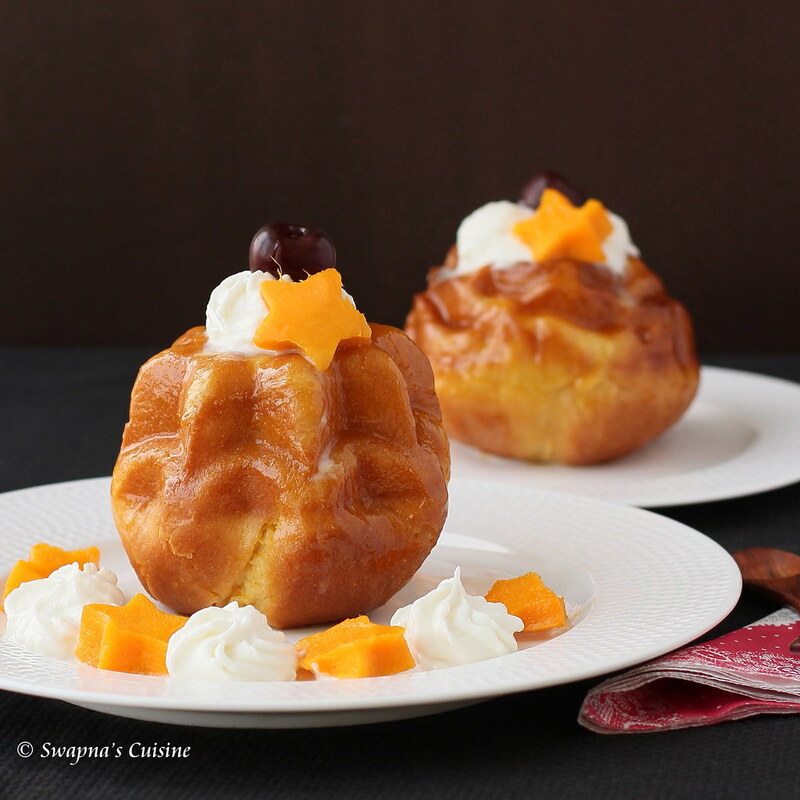 When the savarin is cool and soaked brush it with the glaze and serve filled with whipped cream and your choice of fruits. You can store the dried savarin for 5 days in a closed container. If you have soaked it cover well with cling foil and store it in the refrigerator for up to 5 days. Don’t forget to see what the rest of the Daring Bakers have baked. This Savarin is being YeastSpotted! too tempting and yummy one !! Awesome pictures!! And the cakes look fabulous! Speechless and breathtaking clicks, mindblowing savarin. Oh wow, those are so beautiful! Love the mango stars, and the soaking syrup sounds absolutely delicious. Besides being gorgeous, I love anything and everything with passion fruit! 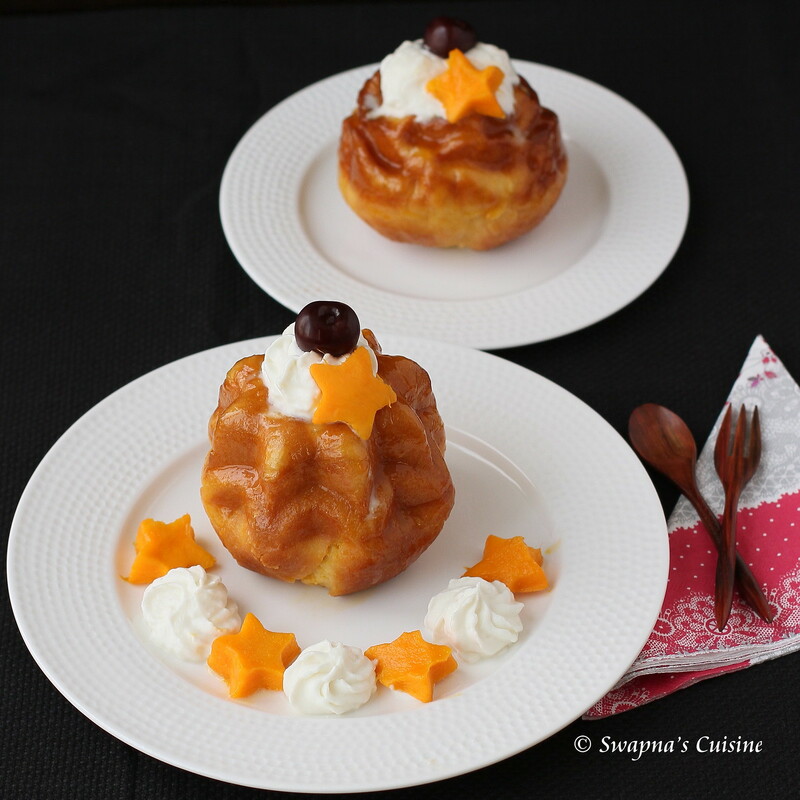 I am so in love with those star shaped mangoes, your savarin looks delectable! !